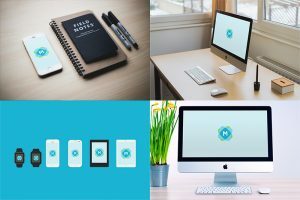 A mockup is a simple way to present your latest web, app, or UI design in a realistic setting. Your screenshot is displayed in a real-life setting, on a beautifully rendered mobile device, or on a lifelike computer screen. Why Would I Use a Mockup? Showing your app or design in a realistic setting is great for product marketing. It can show how people use your app, not just what it looks like. It’s also the perfect way to present your design to a client, giving an extra level of professionalism over a simple screenshot or PDF! We wanted to create a single place where you can get the absolute best mockups from across the internet in a single place. Everything we feature is free to use, carefully selected to be of the highest quality. You can find out more about what mockups are, and how to use them, on our FAQ page.